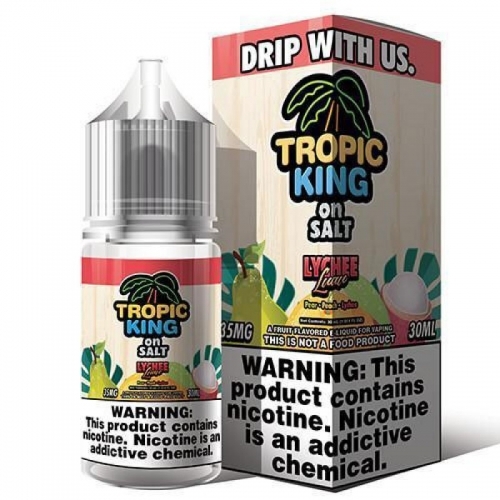 Lychee Luau SALT by Tropic King Ejuice 30ml is a tasty combination of juicy with Pear, Peach & Lychee with menthol. 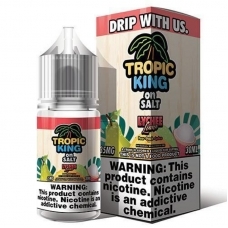 Tropic King On Salt is made with salt-based nicotine at higher nicotine strengths without the extremely harsh throat hit. The main difference of vaping salt-based nicotine is the rapid absorption rate into the bloodstream. Although salt-based nicotine does not absorb into the bloodstream as quickly as combustible cigarettes, its absorption rate is quicker than normal E-Liquid which imitates the rush from a cigarette more similarly. Tropic King On Salt is specifically designed for pod-based devices and other low output/high resistance setups. Flavor: Pear, Peach & Lychee with menthol.